NEW ORLEANS –There’s a new 1-2 punch atop the NCAA Division I Women’s National Team Computer Rankings this week. Arkansas jumped up one spot to first place on the week behind six top-30 NCAA Division I Descending Order List marks set at the Razorback Invitational, while Georgia also moved up a spot to second, announced the U.S. Track & Field and Cross Country Coaches Association (USTFCCCA) on Monday. The Razorbacks were led by Payton Chadwick and Taliyah Brooks on the track this past week, as they posted top-10 Descending Order List marks in the 200 (second) and 60 hurdles (fifth), respectively, at the Razorback Invitational in Fayetteville. The Bulldogs of Georgia saw Lynna Irby notch the best 400 time on the season at 51.48 in addition to posting a 22.96 in the 200, also good for the top spot on the NCAA Division I Descending Order List. 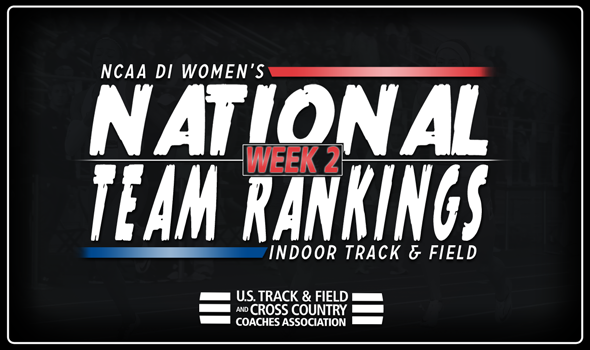 Despite a strong week on the track for Oregon, the Ducks fell two spots to third. While Oregon’s distance medley relay team notched a 11:00.13 at the Dr. Sander Invitational, the team suffered a big blow to its roster as Hannah Cunliffe, the reigning NCAA Division I 60 meter champion, announced she was becoming a professional. The rest of the top-five remained unchanged, as Southern California and Florida sat fourth and fifth, respectively. Texas A&M and LSU each saw a boost in the rankings this week, as the Aggies moved up to sixth while the Tigers jumped two spots to seventh. Texas A&M’s 4×400 relay squad posted the fourth-best time on the Descending Order List this year with a time of 3:32.61. LSU’s 4×400 relay team wasn’t far behind, as its time of 3:34.90 now sits seventh on the Descending Order List. The Tigers also benefitted from Kortnei Johnson’s mark of 7.18 in the 60, which now sits third on the Descending Order List. Villanova and Washington each saw major jumps outside of the top-10 this week. The Wildcats moved up 16 spots to 13th for its highest ranking since the second week of the 2011 campaign. Villanova’s distance medley quartet posted a time of 11:11.76 at the Dr. Sander Invitational, which puts them third on the Descending Order List. Washington jumped from 46th to 23rd after its distance medley relay team’s time of 11:08.83 at the UW Invitational vaulted them to second on the Descending Order List. The ranking is the highest for the Huskies since coming in at 22nd during the third week of last year.